Kitchen living room furniture and interior doors are made of wood with veneer. The floors in the villa are covered with marble. Facing the bathroom and all the plumbing - luxury, a large bathroom with a tub, a small - shower rooms kabina.Vse wall painted with high quality satin paint. Villas installed electric water heating and satellite TV system. All windows are made of PVC villas with glass. On the first ETOGES: entrance hall, bathroom (shower), living room with kitchen together (American kitchen), a terrace and courtyard. 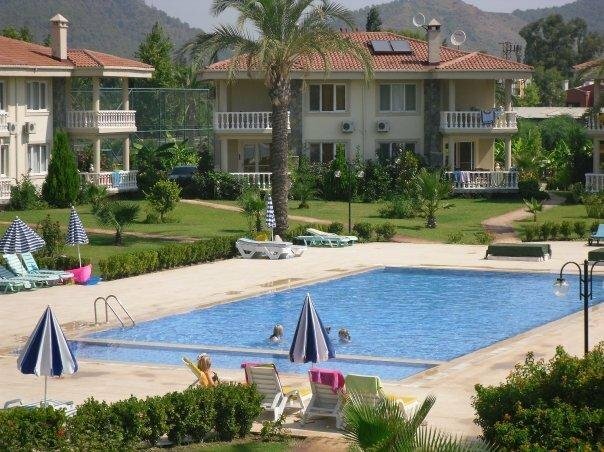 Camyuva holiday village, a picturesque area, the Taurus Mountains covered with pine trees, especially famous for its mild climate and clean sea. The swimming season lasts from May to November, rain and storms are rare. On Wednesdays in the village visiting the bazaar, a major grocery market 5 minutes away by car or a mini bass, mini market in 5 minutes. Near the complex there are shops, pharmacies, rental cars, travel desk, coffee shop, internet cafe, taxi, parking local bus to Kemer. Kemer, one of the major resort towns of Antalya poberezhya.Tam you can find many shops, restaurants, marina facilities. Kemer are large supermarkets on Mondays vegetable and fish market. For children there are in Kemer Dolphinarium, a trampoline, a children's playground. In the mountains (5 min.na car) is a ranch where you can take a course of horse riding, horse riding own children and the mountain trails.